Another topic worthy of mention is where to install the temperature probe at the engine. 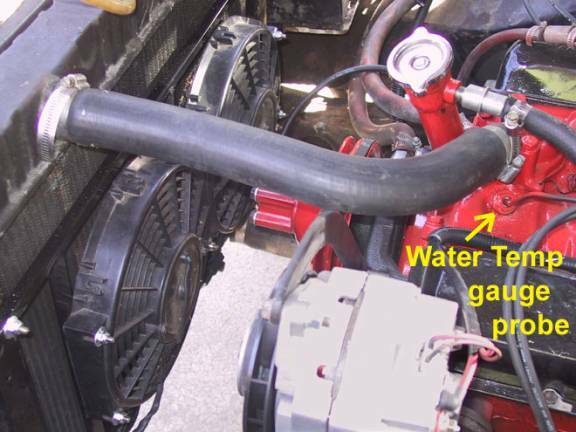 The most sensible place to install the probe for a water temperature gauge is at the intake manifold water jacket, near the thermostat housing. The water thermostat is used to control circulation of the coolant, which will ultimately regulate the coolant temperature in the engine. The purpose of the Water Temp gauge is to monitor coolant temperature. Therefore; with a 180 degree water thermostat in the engine, and the probe installed next to the thermostat, the Water Temp gauge should read about 180 degrees under normal operating conditions. With the probe at this location (next to the water thermostat) we actually monitor cooling system performance, which is the purpose of the gauge. If the cooling system is adequate, then the water temperature measured at this point should be about the same as the temperature rating of the thermostat. We install the water thermostat to maintain engine coolant at the temperature we desire for the particular application. But if the gauge reading climbs significantly above the rating of the water thermostat, then the cooling system is not adequate to keep the coolant at the desired temperature. The above photo, which shows three Water Temp gauge “sending units,” comes to us from our friend Malcolm Dyer, in Barcelona, Spain. Malcolm drives a sharp looking, up-graded, ’86 Camaro. No doubt Malcolm’s Camaro is capable of spoiling the day for the “sports car snobs” in his area, as he has invested much work with high-performance improvements to the Camaro. Not only is Malcolm a very cheerful Hot Rodder, but also for many years he has been researching all aspects of Hot Rodding and reading our favorite car magazines. Malcolm knows more about the history of drag racing here in the states than this author will ever know. Malcolm originally comes from England, where he actually spent some of his younger years working for General Motors. Thanks for the photo Malcolm! While talking to Malcolm about the Water Temp gauge “sending unit,” he decided to move the sending unit from the head to the intake manifold. The new location places it near the water thermostat. The switch mounted in the head always interfered with changing a spark plug, and installation near the water thermostat will do a better job of monitoring the cooling system performance. With the sending unit removed from the head, Malcolm also noticed that the threaded pipe adapter was shrouding the sensor part of the sending unit rather than placing the sensor directly in the path of coolant flow. (See the unit at the right, in the above photo). With the installation of the sending unit in the intake manifold (CENTER), Malcolm first installed the threaded pipe adapter and then cut off the hex-head! 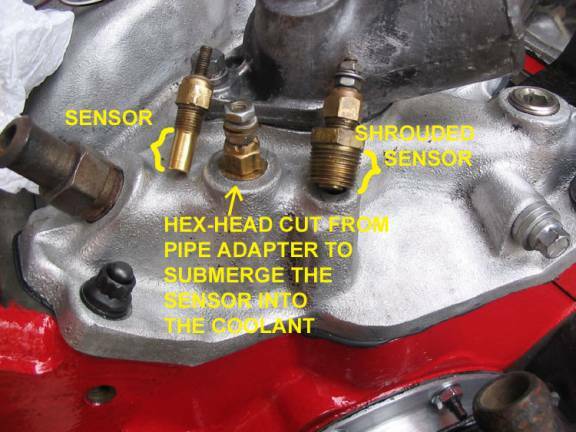 Removal of the hex-head allowed the sensor to protrude entirely through the threaded pipe adapter, which places the sensor directly in the path of coolant flow. Great work Malcolm! Cheers! And thanks again for photos that we can all enjoy. The most sensible place to install a switch for a water temp warning light might be at the cylinder head, which is what the factory often did. (Many of us are familiar with the factory installed temperature switches for the warning lights, at the cylinder head.) 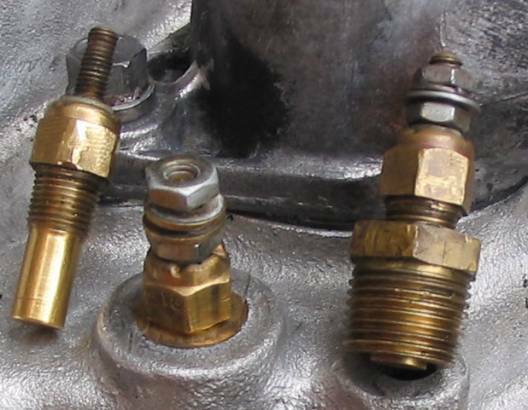 However, these water temperature switches for the warning lights were calibrated to light-up the warning light at very hot temperatures, often at temperatures between 235F and 260degrees F.
Metal at the cylinder head will conduct the heat from the internal surfaces at the combustion chamber of the head. And the coolant, which is in contact with the water jacket surfaces in the cylinder head, will then absorb the heat and conduct the heat away from the head. At the radiator, the heat will be dissipated to the air flowing through the radiator. It’s just normal cooling system function—it’s what the coolant is intended to do for us. But…expect that cylinder heads will have “hot spots;” which is to say that there will be places in the head where the coolant temperature will be significantly higher than the water thermostat rating. When we pull an engine hard, coolant in the cylinder head will be the first to rise above “normal” temperature. Also because the heads will have “hot spots,” the cylinder head is often the most likely to break, or we may have head-gasket failure, as a result of severe overheating. Therefore the head is a practical place to install a switch for the Water Temp warning light, provided that the switch is calibrated to recognize dangerous cylinder head temperatures. And if we have an over-heating problem, then hopefully the “Water Temp Warning Light” will light up to warn us that we may do some damage if we continue running the engine. As the years have gone by, we have had many tech calls at M.A.D. from people who are perplexed with erratic readings displayed by their recently installed Water Temp gauge. The changes in gauge display can be so fast and so different that the people actually thought that the gauge was not working properly; and they wanted to know what kind of problem would cause the fluctuations. In all instances of the erratic display at the Water Temp gauge, the probe for the gauge was installed in the cylinder head (where the switch for an original warning light had been installed). There may have been some factory installed Water Temp gauges with the coolant temperature switch in the cylinder head. (Not to say that this is proper installation.) We can only speculate about why the factory would do these installations. It might have been that the intake manifold did not have a drilled and threaded hole for the water temp switch, with some engine options. Or, the temp gauge switch could have been left in the head to keep wire harness routing the same with “warning light” and “gauge equipped” cars. No matter what the factory did, as Hot Rodders our job is to improve the cars. We should borrow the best of factory ideas, and adapt the best technology to our Hot Rods. We even borrow ideas and equipment from different makes or models, as well as from different production years. We must sort everything, and discard the not-so-good ideas. We should test a few of our own ideas too. The author has wired some custom high-performance boats, which had three Water Temp gauges. There was a probe for a gauge in each of the cylinder heads, and also a probe for the third gauge installed near the water thermostat. Some of the boats had significantly modified engines that were capable of running at high RPM. And at least a couple of the boats were also equipped with Nitrous Oxide systems. It makes sense that with many years of ordinary Chevy V-8 engines with cast iron heads, the probe for the Water Temp warning light was installed in the driver’s side cylinder head (not the passenger side). And… we should also consider that the factory guys at Chevy used “reverse water flow” at the cooling system when the cylinder compression ratio was increased with the high-performance small block, the LT1 Corvette from the early 1990’s. No doubt the reverse direction water flow was intended to reduce detonation by routing the cool water through the heads first—rather than somewhat pre-heating the water as with the traditional flow direction through the block and then up through the heads. The point to the above discussion is that obviously water temperature is not the same at all locations throughout the engine. And it’s for this reason that we should install the probe for the Water Temp gauge near the water thermostat in the engine. With the probe installed next to the water thermostat, the Water Temp gauge will indicate the temperature of the hot coolant being discharged from the engine. With this installation we can monitor cooling system performance; we will know if the cooling system is able to keep the temperature down to the rating of the water thermostat. One last note on coolant temperature; we should be aware that the coolant and water mixture in our car’s cooling system does have a significantly higher boiling point than just plain water. Also the radiator pressure cap used to “close” our cooling system will cause the engine coolant to be under pressure, which will significantly raise the boiling point. With a mix of 50% water and 50% coolant (anti-freeze/anti-boil), and also a high-pressure radiator cap, the coolant temperature might have to rise above 250degrees F before the coolant would actually boil. The information above is very important to recognize because we need LIQUID coolant against the metal at those water jackets inside of the engine to carry away the heat. Steam from boiled water will not absorb sufficient heat to cool the metal parts in the engine. Raising the boiling point of the coolant might increase the “safe” operating temperature of the engine. However the benefit of using coolant mixture and a pressure cap does not increase the “desirable” or “normal” operating temperature of the engine. Expect that performance and life expectancy of the engine may deteriorate with the coolant beyond the desirable temperature. In simple words; we may get by with operating the engine at excessively warm coolant temperatures, and we may never have “trouble” when running the coolant on the warm side of ideal temperature—but it’s not a good idea to do it on a frequent basis. The author’s intention is merely to point out that the increased boiling point with coolant (anti-freeze/anti-boil) and also a pressure cap might allow us to run the engine a little hotter without immediately causing engine damage.